. : Optics & Photonics Focus :: Forging Quantum Teams :. The cone cells in the human eye make it possible for us to enjoy a world full of color. A new technique helps us understand these cells better by measuring their growth in the eyes of a living person. Who would you hire to localize a single molecule? A new detective is now available! A nano-lightning rod can do the job. It can act as a single-molecule fingerprint detective with an unprecedented spatial resolution up to 15 nanometers. A rowing team consists of a given number of athletes; adding or subtracting one would make it impossible for the team to compete. Recent experiments have shown that conditions exist under which quantum particles can also team up in a controlled number. Teaming up in the right number. In rowing a given number of athletes join forces to compete. No deviation from this number could prevail during a competition. Similarly, in Efimov physics only certain numbers of bosons can bind together. 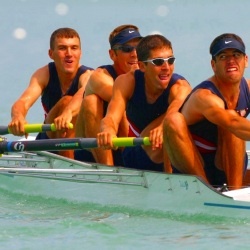 In rowing, athletes team up in many different configurations depending on the specific competition. Taking the Boat Race as an illustration, eight rowers and a Cox come together and work as one entity for the duration of the competition. Analogously, under the appropriate conditions, three or four quantum particles can team up to generate few-body states. Recently, the ultracold atoms group led by Rudi Grimm at the University of Innsbruck (Austria), together with theoretical support from JILA (Boulder, USA), has measured and analyzed special four-body quantum states. These states are so fundamental that their existence has profound implications ranging from the foundations of quantum physics to applications in chemistry. Two is company, three is a crowd – both in everyday life and in physics. To predict the behavior of two is nowhere near as complicated as predicting the behavior of three. For centuries, some of the greatest minds like Newton, Euler or Lagrange have studied the behavior of three mutually interacting bodies — such as three planets under the influence of gravity — and they have come up with solutions for special cases of the classical three-body problem. However, Poincaré finally discovered that this seemingly simple problem exhibits chaotic behavior, which laid the foundation for studies of deterministic chaos and shattered hopes for finding a simple solution for these few-body problems. 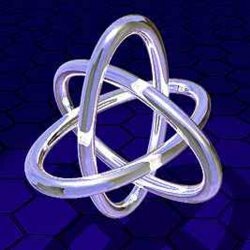 The Borromean Rings. Efimov states are often illustrated by the Borromean rings. All three rings are bound together but no two rings are bound as pairs. Illustration: Mark Lengowski (Cabletron). If a problem of classical physics is difficult, its quantum analogue will, typically speaking, be even more so. Therefore, quantum three-body systems were long considered too complex to study. In 1970, however, Vitaly Efimov made an important prediction concerning three-body quantum systems. Efimov predicted that bosons can form triplets, even though no two of them are bound together; such behavior corresponds to athletes that can only compete if their team is of the right size. Due to the elusiveness of the experimental conditions it took over 35 years until the three-body Efimov states were experimentally demonstrated in Innsbruck in 2006. Today, similar experiments are being conducted in Italy, Germany, Israel and the United States. In order to produce Efimov states, the setting has to be extremely well-controlled. 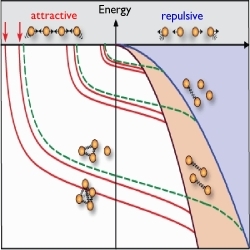 For example, Efimov states are intrinsically rather unstable, and ambient temperatures would quickly break them apart. Therefore, experiments should be performed at very low temperatures. Also, the interactions between the particles have to be very well-controlled. Both of these requirements are fulfilled in experiments with ultracold atomic gases. "The tuneability of interactions," Francesca Ferlaino, research associate in the Innsbruck group, explains "is one of the key features that have led to such an interest in ultracold atoms. In our case, there is a rather strict relation between the energy of the particles and the interaction between the particles in order to observe the few-body state." Earlier experiments on helium, for example, were limited by the fact that only certain parameters could be studied since no tuning of interactions was possible. To overcome this limitation, the Innsbruck experiments have been carried out using ultracold cesium atoms where the interactions between the particles — the scattering lengths — were controlled using Feshbach resonances. Hereby, it became possible to scan a region of very strong interactions between the particles and ultimately control how the particles would team up. Bosons in different configurations. Depending on scattering length and energy, bosons will stay unbound, form pairs, triplets or quadruplets. Once a single configuration of triplets (green line) or quadruplets (red line) is found, an infinite number of bound states can be deduced as they all vary by a constant factor. Illustration: Grimm's group (University of Innsbruck). After the three-body states were finally achieved, it turned out that the researchers were already half way to producing four-body states. "This project shows the importance of theoreticians and experimentalists to work together," Ferlaino points out. "After the initial publication of the experimental observation of three-body states, the people at JILA independently analyzed the data and found out that we had measured a lot more than we knew. Back then, nobody believed that four-body states would play a role in these experiments, so we neglected them. Thanks to their theoretical understanding, however, we were able to go back to the lab and specifically show the existence of four-body states." To some extent, this is like setting a competition for teams of three rowers to compete and then finding out that some of the teams were actually forming teams of four. But, of course, once this is understood, conditions can be set more precisely and the number of teammates can be controlled even better than before. "Efimov states are a beautifully elegant solution in a field which, at first sight, looks so hopelessly complicated," Chris Greene, one of the pioneers of Efimov physics, says. The Efimov scenario is extremely general and implies that if one bound state is found at a certain scattering length, an infinite number of bound states exist, all differing by a certain factor. Furthermore, Efimov states of three particles occur also where the interactions are not strong enough to form pairs. "At the beginning," Greene recalls, "these peculiarities were so surprising that nobody believed it. But when we started out to disprove this effect, we ended up proving it. And finally, we were able to gradually understand more and more about this fascinating field." Ultracold atomic gases are used as a powerful tool to study effects of a large class of systems. As the ability to control these systems is increasingly well established, they are now used to realize condensed matter systems and to study conceptually deep quantum effects. "Of course, it was one of our principal motivations to see if we were really able to measure four-body states," Ferlaino admits, "but now we are even able to go deeper and deeper into the effect." Asking about where the journey will lead, Greene insists that "it is always difficult to guess what the future brings, but there are many dreams: for example, we are hoping to use this kind of experiment with controlled interactions to finally develop a better understanding of high-temperature superconductors, or we might hope that these few-body states help us better understand the formation of chemical compounds." With regard to the present project, Ferlaino simply concludes: "I think that we all worked like an Efimovian team: had anybody been missing, we would have been significantly weakened. But since they were all there, it was a fantastic experience!" F. Ferlaino, S. Knoop, M. Berninger, W. Harm, J. P. D’Incao, H.-C. Nägerl, and R. Grimm, Evidence for Universal Four-Body States Tied to an Efimov Trimer, Physical Review Letters (2009) 102, 140401 (link).